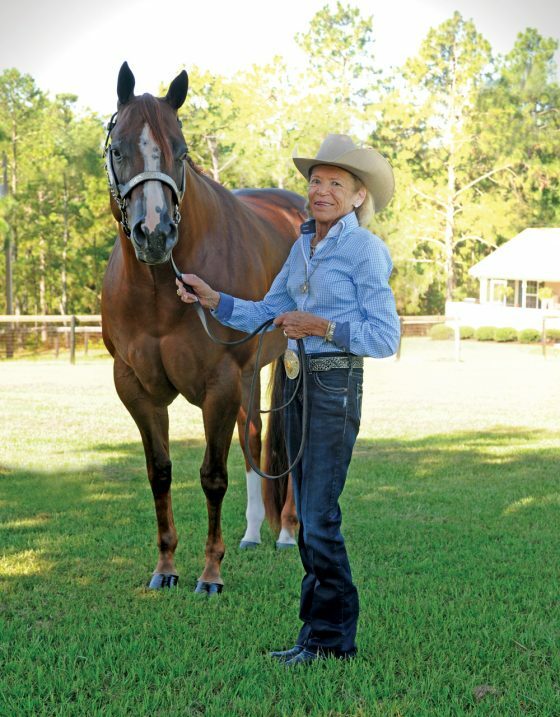 Who has “America’s Most Wanted Thoroughbred?” Katherine Gunter thinks that she might. America’s Most Wanted Thoroughbred is a makeover contest for off-the-track racehorses that is being put on by the Retired Racehorse Project. Based in Maryland, RRP’s mission is to “increase demand for Thoroughbred ex-racehorses and build the bridges to second careers.” The contest itself is designed to showcase the trainability and versatility of former racehorses. Horses competing this year are required to have raced or been in race training any time between January 1, 2013 and December 31, 2014. 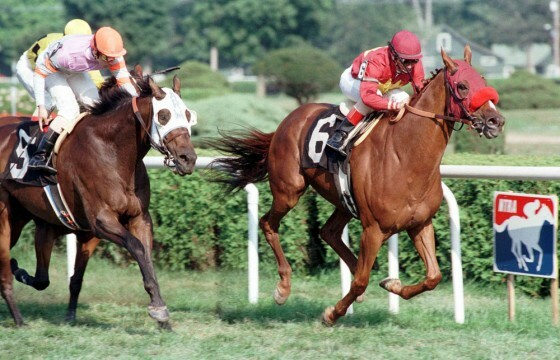 Candidate horses may not have had any training beyond the racetrack before the start of the competition, although they may have had as many as 15 training rides as of January 15, 2015. Over the months, the horses are being trained in various disciplines, culminating in the Thoroughbred Makeover and National Symposium held October 23-25, 2015 at the Kentucky Horse Park in Lexington. 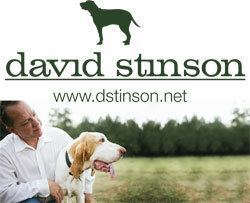 There, they will compete for $100,000 worth of prizes and the honor of being named America’s Most Wanted Thoroughbred. Katherine Gunter, who is the professional huntsman for the Aiken Hounds, had heard about the Retired Racehorse Project and she was intrigued. This winter, Katherine had another prospect, not a Thoroughbred, that wasn’t quite enough horse for her. 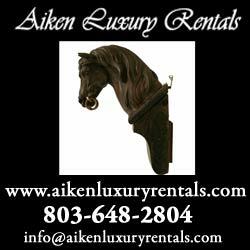 When she sold that horse in Southern Pines, N.C., she happened to mention to the trainer that she was interested in getting another horse. The horse was a 5-year-old bay gelding, about 16.1 hands, with a solid build and a stout hind end. Katherine checked his bloodlines (“they were fantastic, with no Native Dancer crosses, which makes for a sounder horse, and his sire, Alluvial, was gorgeous;”) and she watched a short jog video of him. Although the video was in the snow (this was winter and he was training in West Virginia), she liked what she saw, and so she called his trainer, Eddy Clousten. And that was how, $2,000 later, ($1,500 for the horse and $500 for the shipping) Alluring Devil (Diablo) came to Aiken. “I decided if I rode him once and he didn’t flatten me, I would send in my entry to the makeover,” says Katherine, noting that the $100 entry fee was a pretty modest investment. She planned to enter him as a foxhunter, one of ten disciplines that will be showcased in the competition. He would have to learn to ride out with the hounds, to go quietly in company, to jump, and to stand calmly at checks. Because Katherine is a huntsman, he would also have to learn to accept the whip that she uses to help direct the hounds. Although Katherine is looking forward to the competition in Kentucky, her main goal is to develop a sold, well-rounded horse to be her hunting partner for many years to come. Right away, Diablo showed that he had the right stuff. First off, he loved the hounds. Second, he was very quiet and easy to handle: you could pet him everywhere, pull his mane, clip his ears and his whiskers and he never batted an eye. He did have some things to learn, however. “He didn’t know about horse cookies when I got him,” says Katherine. “I had to push them in his mouth and show him how to chew them. But now he’s a cookie hound.” And it’s true – when she says that he is an “in-your-pocket” kind of a horse, she is not exaggerating, especially if you are carrying treats in your pockets. Diablo was so pleasant to deal with on the ground that Katherine wasted no time, getting on and riding him almost as soon as he arrived in South Carolina. 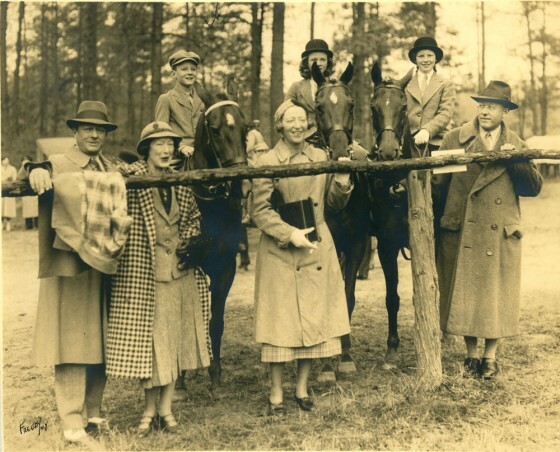 On her first ride, she and her husband, John Dunbar, went out together in the Hitchcock Woods, accompanied by three of Katherine’s retired hunting hounds, Vampire, Maverick and Nipper. In Diablo’s career on the track, he raced a total of 20 times, earning three wins, four seconds and four thirds for total lifetime earnings of $31,970. His last race was in October, 2014, but if Katherine hadn’t purchased him, he would have raced this winter as well. He even had racing plates on his feet when he arrived in Aiken. Aside from some minor hoof issues (easily corrected by farriers from Rood and Riddle, who were in Aiken to tend to some other horses), Diablo has had no soundness or other issues. 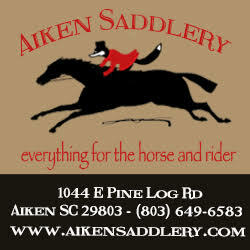 He entered his first competition, the Aiken Hounds Hunter Pace, in March (his team finished third) and got his first taste of actual foxhunting at the Fox Pen in Camden, where Katherine rode him up in front with the huntsman. He is a natural jumper, hopping over logs and cantering down to his fences with a steady, easy rhythm. Katherine plans to continue his training this summer, using him for hound exercise and working on the basics. In September, she is going on a foxhunting trip, and plans to bring him in order to help expose him to new things and get him accustomed to going to new places. A few local horse shows are also a possibility. In addition, Katherine has ridden him in a stock saddle and is considering entering him in the competitive trail division in addition to the foxhunting division. With all of this prep work, along with Diablo’s athleticism and calm, willing nature, Katherine thinks the trip to Kentucky will not faze her new horse at all. Although the exact format of the competition has yet to be published, the Masters of Foxhounds Association has agreed to run the foxhunting division, which will likely include a drag hunt and perhaps a small handy hunter course. “We’re still working on the format of all the competitions,” says Kirsten Lagerquist, who is the director of the Retired Racehorse Project. “People with show organizing experience in each of the different disciplines will be helping us, and we expect to have a big update coming soon on our website.” So far, the event calls for a judged contest in each discipline, with the top three horses from each sport returning for the finale on Sunday afternoon. “At that point, the competition becomes a little more subjective than just giving a horse a score,” continues Kirsten. “Popular vote will be incorporated into it as well.” In the past, the competition has counted input from the RRT website, but last year, one of the main deciding factors was an applause meter, which will probably be used again. This is the third year of the America’s Most Wanted Thoroughbred competition, and the first that welcomed anyone who wanted to compete. The first two years, when the makeover was held at Pimlico racetrack in Baltimore, organizers invited about two dozen hand-selected professionals to enter. These included the two-time Olympic gold medalist Phillip Dutton, who cantered off with the top prize last year aboard Graham and Anita Motion’s Icabad Crane, a stakes-winner turned event horse who finished third in the 2008 Preakness Stakes behind Big Brown. In 2015, when the event moved to a larger venue at the Kentucky Horse Park, the makeover was open to anyone with an eligible horse who got their entries in on time. The response has been overwhelming. The makeover horses run the gamut from actual rescues to stakes winners obtained from some of the top racing outfits in America – Darley, Adena Springs, Phipps Stables. There is even million dollar winner (Eighttofasttocatch, who is being trained for eventing, dressage and showjumping). The most popular discipline is dressage with over 100 entries, followed by eventing and showjumping. Katherine and Diablo’s discipline, foxhunting, is one of the smallest, with just 17 entries. Some large racing stables have come on as sponsors, and several Thoroughbred rehoming organizations have become partners in the event. Kirsten says that she is looking forward to the competition in October. “It’s going to be pretty amazing,” she says. The makeover competition is the featured event of the weekend, which also includes a trade fair, a series of seminars and a marketplace for retired racehorses – some of the horses entered in the competition are for sale, and Kirsten expects a good number to leave the horse park with new owners. Admission to the preliminary competitions is free, but the finale on Sunday will cost $15. For more information about the Retired Racehorse Project and America’s Most Wanted Thoroughbred, visit www.retiredracehorse.org. Or find them on Facebook. Follow Diablo’s progress on his Facebook page, Alluring Devil.